Decorating with tulle can give you a variety of looks for your decor. Tulle (pronounced tool) first arrived on the scene in Tulle, France sometime in the 1700s. The fabric weave is a honeycomb pattern that creates a versatile mesh material. The fabric's weave made it an ideal choice for petticoats and crinolines. Air moves through the material which allows using it for layering without the heaviness and heat buildup of previously used fabric. Starch is often added to help the delicate fibers hold shape. The material's wispy appearance gives an almost fairy-like appearance. The fabric grew in popularity for fashion choices in the 1800s. Tulle was mostly used for ballerinas' tutus until a royal wedding. Queen Victoria is credited to making it the popular choice for wedding dresses. It went on to be part of the decorations for wedding ceremonies and receptions. The gauzy quality was especially useful as veils and was incorporated in many hat designs. When using tulle for decorating, you may first think of traditional uses associated with weddings. This certainly is the most popular use for the material. You can also use it in your home to create an ambiance of nostalgia and mystique. The fabric's hexagon construction helps it to be pliable yet affords it the ability to hold a form without collapsing under its own weight. Aside from the obvious fashion applications, you can use tulle to give your weddingan airy and dreamy feel by using it to decorate the church, garden, reception hall, and any other setting. Tulle is often used to make bows for wedding decorations. You can do this yourself or purchase ones already made. You can mark the pews for your families with a bow at the end of each pew. Many floral designers will use a single large bow or combine it with floral decorations. You can repeat the color scheme of your wedding with lengths of the material extending from the bow. A tulle bow with a center made of wire beads and other wedding-themed decorations makes a nice touch at the base of candlesticks often placed on serving tables and dining tables. If you're doing your own floral designs or want to help reduce the expenses, order plain arrangements then add a tulle bow. You can also use the material to create rosettes to place around the base of the flowers for a charming effect. You can also create bows for the table corners. Add springs of baby's breath and pearl beads to complete the look. If there's a fireplace in your setting or reception hall, complete it with bows on the corner of the mantel. You can place a floral arrangement in the center of the mantel to complete the look. You don't need to confine your use of this material to only bows. One of the great uses of this material is to wrap various wedding gifts. You can use different colors to make it colorful and fun. Tulle makes a great tablecloth. You can place a colored length of material over a white tablecloth, use white on white, or go for a different look with a solid colored tablecloth covered with a length of white material. If you embroider, you can dress up the material with added decorations. If you prefer a faster route, you can purchase lace appliqués and either stitch them to the fabric or apply with fabric glue. Either method will give your tablecloth a finished look. Dress up a wedding entrance way, arbor, portico, gazebo, or garden entrance by framing it with colorful choices. You can go simplistic with a simple bow and streamers. You can also create an airy, fun look by gathering the material into generous over-stuff bunches and tie with colorful ribbon streamers. Don't forget the bows and flowers. Tulle can be used in your home design. You may think this fabric's home design is limited to a little girl's room. While it certainly is a great fabric to create a fairy princess's room, you can use it to add wisps of nostalgia to other rooms, especially if you have a Victorian home design. One of the most popular uses in home décor during the Victorian era was for sheers, curtains and draperies. The material was perfect for privacy while allowing air to enter and circulate throughout a home. 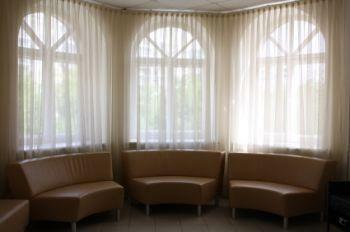 You can use it for draperies in any room design. Bed netting is not only a great design element; it originally served to keep mosquitoes away from you while you slept. Because it's manufactured with a very tight weave, it became a popular choice to add a romantic style to a very important and functional use. Bed netting was popular as a curtain that surrounded a four poster bed. Bed canopies were also designed using this gauzy material. You aren't limited to traditional uses of this amazing fabric. If you're designing a little girl's room, get creative with the many weaves and colors available in this material. You can purchase tulle at almost any fabric store. If you have the right décor, you can make decorating with tulle a natural part of your design elements. .